Women are hardwired to connect. • A larger corpus callosum, on average, that enables them to engage logical and creative thinking at the same time. The difference in size and shape of this central structure of the brain also enables them to decode body language, tone of voice, and facial expression more easily, take in a more inclusive perspective of situations and typically view the different elements of a problem as interconnected. • A larger anterior cortex that many scientists say results in a superior ability to integrate memories and emotions into more complex patterns of thought, consider more options, and imagine a wider array of solutions. • A larger prefrontal cortex, the part of the brain that controls judgment and decision-making as well as fosters a tendency toward win-win solutions, compromise, and ways to serve the needs of others. 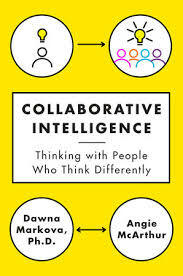 We all have specific wiring in our brain to tune into, use, and expand collaborative intelligence. It can grow us and we can grow it. But the gift of women’s natural capacity to use it remains largely ignored or is considered irrelevant. Why is this? The first and most obvious reason is that there are comparatively very few women in positions of influence: Only 23 CEO's in the S&P 500, for example. Helena Morrissey started a UK based initiative five years ago, the 30% Club, whose mission is to raise the proportion of board directors on the Financial Times stock exchange (FTSE) 100 index to least 30% female. She sees diversity as a business imperative because diverse boards are more innovative. In our experience, they are also more collaborative. She won the support of a core group of chairmen and CEO’s (many of whom had daughters) who spread the message. There are now no more all-male boards left on the FTSE 100, and twenty-three companies have already reached the 30% mark. There is another less obvious reason why women's capacity to collaborate is often dismissed or ignored. Working for fifteen years as Professional Thinking Partners to CEO’s and senior leadership teams of global corporations, we observed that when there is a majority of men making decisions, the norm is to respond to a complex problem in one of three habitual ways: fight, flight, or freeze. “Fight” would show up as rigidity, the need to be in control, to be right; “flight” manifested as withholding, or avoiding; and “freeze” was exhibited as withdrawal or appeasement of whoever was in charge. This prevented an essential exchange of information, damaged trust and disengaged the team members from their intention. When questioned about this, some of the men we interviewed shrugged and changed the subject. Others told us that they had been trained to be rugged individualists. They were using what neuroscientists call the “default network” of the brain. There are those who will always prefer to fight than switch. There are also situations when flight and freeze are the most effective strategies available to you. It's also important to know you have another option of response. Given this, what’s the best we can do? One of the most remarkable new understandings about the human brain is called "neuroplasticity, " meaning both male and female brains continue to grow, change, and adapt throughout our lives. Even making mistakes can grow the brain. What changes your experience will gradually change your brain. There are multiple social networks hardwired into both male and female brains that are designed to do that by connecting with our own needs as well as those of others, recognizing our own truest intentions as well as those of others, and harmonizing both. Think of the way individual voices in a choir can retain their own quality while simultaneously synchronizing both into one melody. Great leaders help people believe in what can be possible. Our recent work with CEO’s such as Jeff Dunn of Bolthouse Farms, Al Carey of Pepsi Beverages, and Jacki Zehner of Women Moving Millions reveals that all of us, regardless of gender, can learn to develop the fluidity of collaborative intelligence. 1. Place one hand in front of you and bring to mind a charged situation with someone else. Imagine your hand is representing your mind: Is it closed into a fist, limp, or wide open. 2. As you continue to think about that situation, allow your hand to open with the palm facing upwards. Ask yourself curiously what would you have to do or say so that you, in that charged situation could connect, understand and harmonize. From the Book COLLABORATIVE INTELLIGENCE by Dawna Markova and Angie McArthur Copyright © 2015 by Dawna Markova and Angie McArthur. Reprinted by arrangement with Spiegel & Grau, an imprint of Random House, a division of Random House, Inc. All rights reserved. Click here to order the book. ©1995-2015 Feminist.com All rights reserved.